Do you remember meeting Nerdy Birdy? He's back! This time he is consumed by social media. As often happens, his interest in everything electronic threatens his friendship with Vulture. They have been best friends since they first met. Their differences are inspiring to children who also march to the beat of a different drummer. But, they like many of the same things; thus, they have bonded over their love of silly faces, taking goofy pictures of each other, and gasping over what the other is eating for lunch. Vulture is not keen on video games. But, she listens to Nerdy's glowing account of what his new game does. or may not, text you back. 2. Play games with them all. Vulture quickly departs, leaving Nerdy to count on his new 'friends' for support. The realization that 'one real live you is worth a thousand Tweetster friends' puts them back on solid ground. Theirs is a friendship full of compromise, understanding and admiration. Aaron Reynolds has created characters for his readers to love and Matt Davies ups the humor and angst with pen, ink and watercolor images that are inventive and energetic. They are a great team! 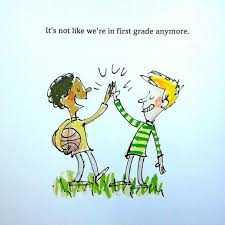 Friendship is the message here, allowing for a young audience to think carefully about how we treat each other. It might also give pause to those sharing it with their own children. That could be a very good thing! piece of last night's turnip. I read this once, and then promptly read it all over again! Fox is quite the appealing and obnoxious character. He is intent on stealing chickens. His favorite haunt is the henhouse. Never successful, the pig provides a turnip with every failure. Fox is so HUNGRY! Even the chickens aren't scared of him, and treat him with disdain. Fed up, he turns to Wolf for advice. Perhaps the two can steal some eggs and hatch their own chicks. This idea comes with a BIG problem. When the chicks finally do hatch, they assume that Fox is their mother. No matter how hard he tries to convince them they should be very afraid, they refuse to heed his warnings. Despite his actions and motive, it is very difficult to dislike Fox. He is so inept, it's hard not to feel for him. Benjamin Renner has created a graphic novel filled with slapstick comedy that will have readers laughing out loud (as I did) and shouting to share it with friends and classmates. This book will make its way from desk to desk, and then back again. 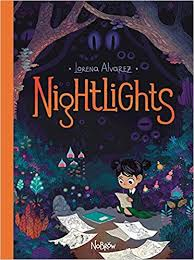 Done in watercolors, and using spot illustrations and clever dialogue throughout, it is smart, energetic, and downright enjoyable start to finish. Expressive at every turn, there is no doubt about the emotions felt and the feelings shared. 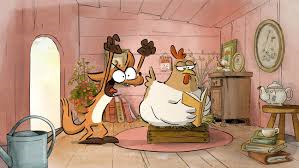 Fox loves the chicks, Wolf wants his dinner, Mama Hen wants her babies back ... it is a comedy of errors, love and full-out action. A host of terrific characters, spot-on humor and a story that just doesn't stop is sure to make this a lasting read at home and in classrooms. In hoots and in moans. 'crooked old house' along forest paths in moonlight, facing delights and danger, always on the lookout. As a mermaid counts pearls." Perfect it is, and worthy of repeated sharing. What a lovely setting K.G. Campbell has created for this slightly spooky tale, using colored pencils and watercolors to full effect. After the cool tones of the nighttime and its moonlit dappled paths, yellow and red add a spot of welcome when she find the cottage and its reader. Only the dog shows some concern with the tiny waif as she settles in to listen, much like the young girl whose mother shares this lovely bedtime story. "Jabari started to climb. Up and up. This ladder is very tall, he thought. "Are you okay?" called his dad. "I'm just a little tired," said Jabari. "Maybe you should climb down and take a tiny rest," said his dad. A tiny rest sounded like a good idea." It's time! Jabari has everything he needs for the big day. He passed his swimming lessons. He's wearing his swim trunks. His eyes have protective goggles. He know he can jump. And, he's not scared. Or is he? 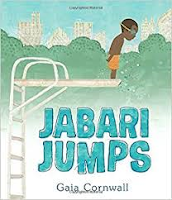 Jabari seems unconcerned as he and his dad check the pool, the diving board, and even the height of the ladder. He appreciates his dad's firm clasp of his hand, and the lack of pressure to do what he has planned to do. Dad even offers an out, suggesting a rest as he climbs the ladder, and the opportunity to wait until tomorrow. feeling scary and feels like a little surprise." What little boy doesn't love surprises? It is exactly what Jabari needs to hear. Up the ladder, off the board, a big SPLASH! and back for more. What a day! Overcoming a fear seems easier to do when a parent has your back, offering up whatever you might need to face the fear and accomplish what you set out to do. Impressive summer images were created in pencil, watercolor and collage, and then colored digitally. Changing perspectives are effective in understanding the fear felt, as well as the support given. While swimmers will no longer be using outdoor pools in many places, the thrill of a new accomplishment is not diminished when achieved at an indoor one. Both venues provide an opportunity for water fun and frolic. Who among us will not be rooting for a tentative and brave young man wanting to prove he has the wherewithal to tackle a brand new challenge? You go, Jabari! This equally beautiful companion to When Spring Comes (Greenwillow, 2016) applauds the beauty to be found in fall. It is evident when we look outside at the changing colors, feel the cool of the autumn air, and recognize September will soon be history that we have moved past another summer and are looking toward winter's cold. Thankfully, autumn helps to bridge that gap. Kevin Henkes and his wife Laura Dronzek know this season's beauty. In simple, telling words and luxurious acrylic art, they share with their readers a glorious look at this very special (and often, too short) season. Vivid in its abundance, it is the time of year for taking stock, opening our eyes and ears to its color and the eager preparation for what's to come. Mice munch, squirrels scamper, families reap the benefits of gardens and orchards in preparation for the winds that will soon whisk all signs of summer from our sight. Leaves swirl and settle. Children leap into leafy piles. We all appreciate its soon-gone beauty as we prepare for nature's next season. the sky will be white and empty - "
Simply lovely on every page shared, it is the perfect introduction to yet another season from this talented pair. I hope you still have many days to spend outside, basking in its splendor and the fading light and warmth. 80% of his daily vitamins. Do you try to keep up with trends, or opt for what is most comfortable? It is a often a tough decision for adults, never mind children, teens and animals! Harbet has a much loved hat, made by his Nana when he was little and offering warmth and comfort every time he wears it. 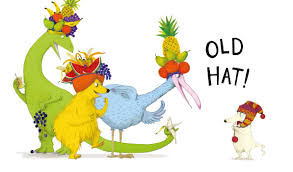 When his friends, who sport the fruity, turban-like headgear currently in fashion admonish him for wearing an OLD HAT!, he checks out the hat shop and finds one to match. It is very like what the others are wearing, but comes with its own set of problems. Soon, the birds have picked it clean. Harbet becomes the object of further laughter and mockery for wearing an OLD HAT once again. This time their hats are fashioned from pylons and spotlights. Off he goes. By the time he has his, they have a new one. What is a fella to do? Determined to be first in fashion, he tries all the latest trends. The others are always ahead of him. Recognizing the futility of the process and wanting to be himself, he removes the hat ... and sets a trend of his own! Kids will love the illustrations. You will not be surprised if you are a fan. 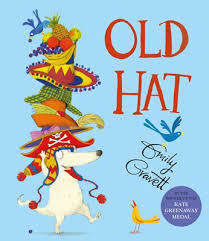 Emily Gravett creates brilliantly colored, bold and inventive hats that cause giggles and careful attention to detail. Imagine the creations when young children are given the materials and motivation to see what they can do - when it comes to wearable headgear! Learning to be true oneself is valuable motivation for change. "Beatrice marched to the emergency clothes bin, determined to find something to wear, determined to get back to Lenny. The blue lid popped off with a snap. "It's time to take matters into my own hands," she said. A tangle of cast-off clothing filled the container. Beatrice took a deep breath and dug in. She considered each item, one by one. Then she tossed them aside, two by two ... and too by too." 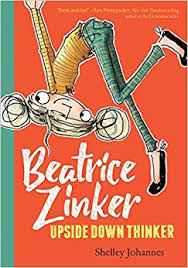 In this first book of a new series, we are introduced to Beatrice Zinker, a third grader who does not look at the world in the same light as most of her classmates. She doesn't want to be in their box, preferring to see the world from an upside-down point of view. It mostly works for her, although it does result in a few blips, and some unusual responses. Beatrice is keen to get to school following the summer break, after previously planning a spy mission for herself and her best friend Lenny. Lenny (also known as Eleanor) has other ideas. It is as if she has forgotten everything the two had talked about before the summer break. She comes to school in a dress, with a new friend in tow. This friend wants to play veterinarian at recess, and Lenny is agreeable. Where will that leave Beatrice? Beatrice is not keen on sharing Lenny with Kate. But, she makes the best of a changed situation. 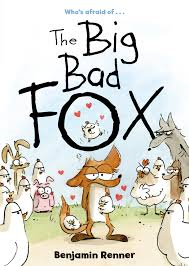 The story is filled with humorous drawings that match her quirky character, the punny dialogue, and the constant action. Although her relationship with Lenny is changed, Beatrice remains a force to be reckoned with; well-liked, appreciated, confident, and refreshing. Beatrice is kind, friendly, inventive, obliging, and someone we will be happy to meet in future stories. Great for the non-conformists, and much needed for those who are beginning to make decisions about who they want to be. It would make a terrific class read as the year gets underway, providing opportunity for careful consideration and thoughtful discussion. But your mom sits on the steps and watches." My kids were lucky to live in the same city as their grandparents. In order to keep them straight, they were called Granny and Grandpa, and Nan and Grumpy. People would often look askance if they heard our conversations with Grumpy, who was never that way! 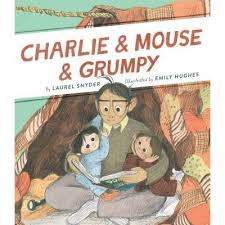 When I saw Laurel Snyder's second story about Charlie and Mouse, I was thrilled that they also called their grandfather Grumpy. My dad died many years ago, and my granddaughters only have the stories we share with them to help them know the wonderful man he was. Grumpy is an unusual name for them at this point. Having this book, they will learn about another Grumpy and how similar he is to their great-grandfather. Charlie and Mouse are thrilled to welcome him for a surprise visit. Grumpy's dry humor and full attention is much appreciated, as he spends his days with his ever-growing grandsons. There are four short chapters, each describing a single episode: Medium, Pouncing, Songs, and Good-bye. When Grumpy notes that Charlie is getting 'big', Mouse reminds him that Mouse is not. Grumpy is reassuring. Mouse agrees that he is 'getting medium'. On they go to new discoveries and adventure. Pouncing on Grumpy while sleeping is the plan; Grumpy is already awake, drinking coffee. Blast! There's no catching him early in the morning. But, later in the day might provide opportunity. While babysitting, Grumpy proposes food, entertainment, ideas for fun. A good night song reveals Grumpy's terrible singing voice, no matter the chosen song. Charlie takes over. Finally, when the time comes to say good-bye, the boys are extremely sad. That is as it should be! 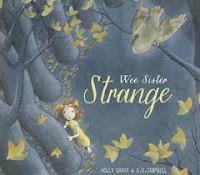 Charming, warm, and perfect for early readers. The illustrations have a comfortable, familiar and affectionate feel. I will look forward to future editions. is now mine," announced Lennox." There is a lot of talk about power and control in the news today, and every day it seems! If you went to school, even if you can barely remember being there, you will recognize the kind of power often wielded on school playgrounds. Have the rulers been designated during your first few weeks? They likely have done their best to establish territory and dominance. For young children it is a lesson tough to learn. The powerful seem to take for granted their place in the hierarchy, and others too often comply. All it takes is one person to upset the status quo; a person who might actually lead to a bit of a revolution and deliver a revelation. In this astute and often humorous tale, Jonah makes himself 'king of this land' - the school playground. The front endpapers offers a look at "Jonah's Park" as established by said ruler. Everything is my on the map. There is even the suggestion that the big field might have booby traps! "This side of the playground is now mine,"
and promise to follow my rules." The swings are an enticement. Soon, Lennox's side of the playground is rife with children and an argument ensues. A divisive map is drawn. Both rulers make elaborate plans for growth. Their thirst for power becomes overwhelming. Soon, they are on their own. A new plan is made; the leaders rethink their actions; the playground is, once more, a happy and vibrant environment. 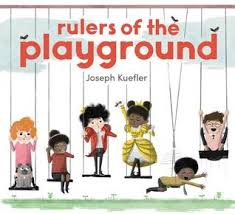 The thirst for power is pointedly evident in the endpapers and the demeanor of the two vying for dominance over all playground participants. The expressive faces of the other children show exactly how happy, then frustrated, they get with decisions being made for them. It is great fun to pay attention to them as the conflict rages on. I love the double page spreads reflecting the playground panoramas, and all of the action. The art of compromise is a welcome outcome ... perhaps! 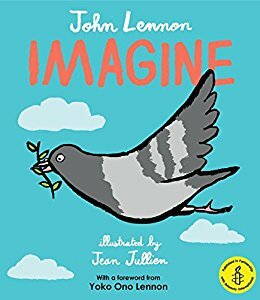 you'll join us ... "
Today is the United Nations International Day of Peace, and I want to share this beautiful new book with you. It is perfectly appropriate for these trying times. 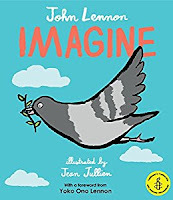 It is the first published picture book set to John Lennon's original lyrics, and has been created in collaboration with Amnesty International. Let's hope it helps each one of us to imagine a better world, a world at peace. Jean Jullien has chosen a pigeon as his main character; a bird bent on spreading the message of peace and friendship to the birds of the world ... no matter their color, their shape or their size. She offers an olive branch, a gentle hug and encouragement to live a life without conflict. With every positive message passed on, the feelings grow. In the end, when the pigeon is exhausted by its efforts, the birds previously met join her on a branch to show they are now all willing to 'give peace a chance.' It is a gentle reminder to readers to pay it forward. 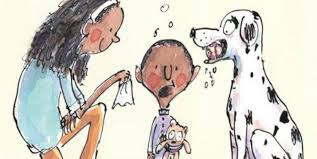 By sharing such a thoughtful and beautiful book we encourage empathy in the kids whose lives we share, and offer a message to them that they can make a difference when they care about others. Speak up! Be strong! Let your voice be heard, just as John Lennon let his voice ring out for tolerance, unity and understanding. It is a lovely book, and I'm sure it would find favor with its famous songwriter. He was a dedicated campaigner for a better, more peaceful world for all. Yoko Ono Lennon adds a foreword, Amnesty International an afterword that speaks to readers of the importance of human rights, now and forever. It provides information about becoming an AI member. With every copy sold, money will be donated to help raise needed funds for the charity. If you are interested in others who want to spread a peace message, or want to add one of your own, you can go to http://www.thecreativecorporation.com/portfolio/ for more encouragement. "To Lester, the middle-of-the-night quiet was the quiet of a strange house. It had a persistent whisper in it, and he was sure that whisper would eventually get Daddy Rich to mutter, " What's up, little guy?" or get Albert to swing his long legs and big feet off the bed and into his great big slippers and to stand up and put his arms ... "
For those who have admired Vera Williams' wise and marvelous books, this is posted with the sadness that comes in knowing it is her last. Published posthumously and illustrated by the incomparable Chris Raschka, it is a worthy story to share. It is a story of adoption. 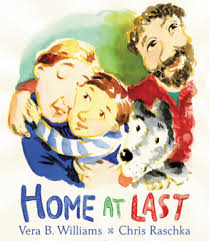 Lester is a young boy living in a group home as he waits for the completed paperwork before he can be adopted by Daddy Rich and Daddy Albert, and finally go home with them. "It always takes a long time to adopt someone. Lester had visited Daddy Albert and Daddy Rich a lot. He had a picture by his bed of the three of them, plus Wincka. In the picture they already look like a family." Changing the family dynamic and learning to live with a new reality for all is a learning curve, and not always easy. Having made many moves, Lester is not ready to have his little blue suitcase stored in the attic. It is a haven for his most prized toys, where they are protected and safe from harm. "So every evening, after Rich or Albert read his a story and tucked him in and Wincka eased off the foot of the bed to follow them out of the room, Lester talked to his action figures. Afterward, he carefully arranged them in the suitcase and zippered them in." It isn't long before he and his suitcase make their way to his parents' room, waiting patiently at its side in hopes of being noticed. Concerned for his health and worried about his nightly visits, they do not understand his urgent need to be scooped up and placed between them, with Wincka at his feet and his suitcase nearby, in an attempt to feel safe. Lester cannot explain his stomach churning worry. "They explained that all of them in bed together was special for Sunday mornings. Mornings when they could sleep late and no one had to go to work or school. And perhaps they could even eat pancakes in bed." It is a difficult and somewhat lengthy transition. There are so many surprising, lovely moments. Lester eventually shares his fears, the parents face their own worries, and Wincka puts it all in perspective. "Two not-so-smart dads. One brilliant dog," said Albert. "Maybe Wincka should have adopted Lester instead of us." Chris Raschka's watercolors bring life to a house that is full of energy and warmth. He creates a 'home' for all. 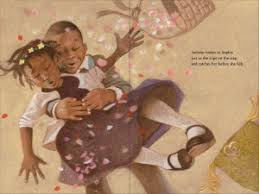 He finished the book following Ms. Williams' death, focusing on talks they had together and the sketches she had made for this beautiful final work. The notes that follow are informative and important. Her name is Morfie ... "
Sandy's imagination and creativity are vividly portrayed in wondrous spreads alive with color, movement and form. They originate in her dreams, and she spends her spare time bringing them to life on the page the following day. When a new friend approaches her during a school break asking to see what she has drawn, Sandy is pleased. This friend is unseen by her classmates, and mention is made that she might be the girl from the fountain, where she drowned. It sets an eerie tone. Often her homework and her time spent at school suffer because of her vivid imaginings. She is admonished by her teachers and parents for succumbing to distraction. Morfie, her new friend, is responsive to her art. Her ethereal presence is soon felt in Sandy's nighttime world as well, when she appears wanting to take charge of what Sandy is creating. Morfie's demeanor changes dramatically, becoming demonic and cruel. Readers will know Sandy is in danger, and be grateful for her ingenuity. The palette choices are bold and brilliant, filling the pages with color, action and interest. The graphic format is sure to appeal to many readers. Sandy's nighttime world is full of wonder. Eerily compelling and sure to captivate its readers, this is a magical world. Those who love fantasy and imagination will want to read it more than once. "Huge German bombers called Gothas flew over, seemingly whenever they wished. Shells exploded all around. Survival or death was largely a matter of luck, and sometimes Russell's diary reads like a catalogue of his friends dying." 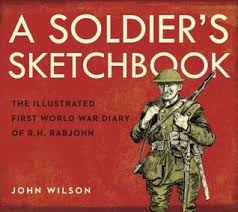 There are many books about World War I. John Wilson is an exemplary historian and writer. 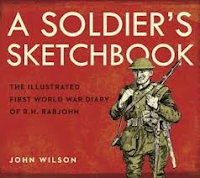 In this book he bases the writing on a memoir written by Russell Hughes Rabjohn, A Diary: A Story of My Experience in France, and Belgium, during the World War, 1914-1918 (1970), and on sketches he did while serving Canada during that war. It is a unique look at the conditions, the fighting, and the horrific effects the war had for so many. Russell recorded his thoughts and images even though it was against all protocols and orders. A trained artist, he carried a sketchbook onto the battleground and was able to maintain a record of what he experienced. The thoughts and images he recorded are integral to the work John Wilson has done to bring his story to young readers today. Each section begins with 'background information' to describe the war's current events and encompass the young soldier's entries and images. Russell's war began on February 22, 1916 with training. At 18, he could join the Canadian Army and he did. His diary entries begin on Thursday, September 7, 1916 while still in training. Placing his entries alongside Mr. Wilson's explanatory, descriptive text gives readers a real sense of the hardships, the soul-destroying action, the toll it took not only on humans, but on animals, nature, and the towns and homes destroyed. He gives historical context to a young soldier's writing. Vivid and honest, it is a book that is unique in the canon of First World War literature. These edited diaries, enhanced dramatically with first-hand, heartbreaking images of the devastation, provide an invaluable resource for those with an abiding interest. Back matter includes a First World War timeline, an index and suggestions for further reading. and his brain felt full. Little Louie didn't want to color." 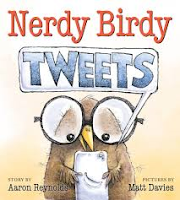 I defy you to read this book aloud before you have done a lot of work on the voice needed to share it. In fact, the directions on the front cover are clear: 'to be read as though you have the worst cold ever'. I want to hear my friend Don read it! It is funny, and very, very ingenious. And a test for your storytelling skills! Louie has a COLD. I mean, it is a cold of colossal proportions. He is disconsolate. The only 'thing' that brings comfort is his mom! Maybe hot chocolate? It not even a close second to the attention needed every three minutes from his mother. You know those days, don't you? Hearing his cries for Mom which sound more like BOB than MOM, his Great Dane, ever responsive, slobbering dog Bob comes quickly to his rescue. Bob is ignored in a plea for BOB! To say Bob the dog is confused is an understatement. With each demand made of his mom, Bob comes running. So funny! Kids will be howling with excitement. Matthew Cordell is the perfect artist for capturing the craziness of the situation. Bob drools endlessly and everywhere; Louie's head expands as his cold worsens; his mom's patience is in jeopardy; the ever expanding mess of an untended home is evident; until, one afternoon of total bed rest (with mom and Bob) brings lasting relief. Unfortunately, it is not the case for Mom. "Outside the laboratory, nobody knows they are there. Outside, there are just peaceful desert mountains and mesas, cacti, coyotes, prairie dogs. Outside the laboratory, in the faraway nearby, artists are painting beautiful paintings. Outside the laboratory, in the faraway nearby, Hopi Indians are carving beautiful dolls out of wood as they have done for centuries." With all the rhetoric being reported between the United States and North Korea in the past month, I think this book is highly appropriate for sharing in homes and classrooms. Look for it at your library or in your favorite bookstore. It is sure to inspire conversation and connections to current world affairs. 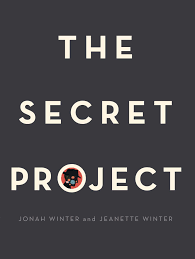 Jonah Winter does a first-rate job of introducing readers to the development of the first nuclear bomb. It will cause readers to think and ask questions about the scientists who worked under mysterious circumstances to build that bomb. conduct experiments and research in the laboratory. They are working on something they call the "Gadget." they cannot even call it by its real name." Jonah manages to capture the intensity of the work alongside the majesty of the desert environment. The color of the outside world shifts to the darkness and obscurity where those scientists work secretly, without rest. Readers are witness to the work, and the events that lead to the countdown to detonation. it is hardly even imaginable." Jeanette Winter's artwork is exemplary, using black (and darkness) to great effect in creating a mood that is memorable and frightening. The utter blackness of the final spread, following the spectacular images of the bomb's power reflects the silence it inspires. It is an 'awesome' introduction to a very scary time in history, though none of that is mentioned until a very informative and frightening Author's Note. In it he includes this " ... as of 2016, there are 15,700 nuclear weapons still in existence throughout the world. Hopefully some day that number will be zero.” Or, perhaps that number is on the rise. The facts are in the text of the book. Mr. Winter's own comments are in the note he places in back matter. It is not written with a message for readers. "As a nonfiction author, my job is to tell the truth. And my mission as an author is to introduce young children to chapters of history which have been systematically omitted from their education. 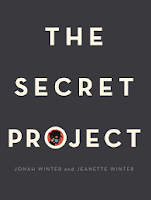 For instance, the making of the atom bomb – the topic of my book, The Secret Project. It’s a picture book about how scientists and the American government created the first nuclear bomb. Their collective motivation as a character, as they were creating their “gadget” (as they euphemistically referred to it), was to conceal. My motivation as a character, in this book and various books I’ve written for children, is to reveal." 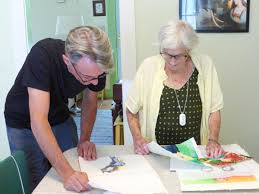 He and his mother, a brilliant and gifted artist, ensure that all readers will know this part of history. Tony and Tom are of a bygone age. Their love for each other and the work they do together is fully in view here, through words and pictures. I love this quietly beautiful homage to community and the past. Before delivery trucks and big grocery stores, families bought butter, eggs and milk from delivery horses and their drivers. Ed Galing obviously had a love for one of those horses. and his eyes would glow ... "
He quietly describes the nightly visits in a gentle poem, inviting readers to share that earlier time. Erin E. Stead uses Gomuban monoprinting and pencil for her reminiscent images that show what each day was like for Tony and Tom as they provided a service remembered only by those who lived back then. The warm glow from the barn light is matched by streetlamps along the way, the porch lights that welcomed the two at houses on their route, and finally the joy of dawn. The pencil sketching in soft green and grey allows for a textural and detailed portrait of the horse, and his work. 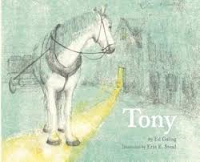 Children with their natural affinity for animals will admire everything about Tony, a horse remembered and honored here with great affection. Jackson to get him going, too. no matter what ... "
No one is more fun to watch at weddings than the children in attendance, especially those who are part of the ceremony itself. You never know what might happen. You know, for sure, they are going to be precious to watch. It is, with great delight, guests gaze on in wonder as they make their way up the aisle. Later, they will join in the merriment with less pressure for performance, thank goodness. Jackson is ring bearer for his mom's wedding. Sophie is the flower girl for her dad. The two youngsters, who will soon become a new family, have an important role to play. Jackson is a bundle of nerves, wondering how this new family will work, and worrying about the very important job he has during the ceremony. and mess it all up. Sophie has no such worry, hurrying off with her basket in hand and strewing flower petals at a furious clip as she goes. When he notices that Sophie is heading for disaster, Jackson quickly assumes the 'big brother' role and sets things right! Perfection! This family story is shared with warmth and great affection. Simply told and easy to follow, it is also sharp and expressive in comparing Jackson's two roles ... at the wedding and in the new blended family. Reassuring and accompanied by Floyd Cooper's winning portraits of the day's stars and wedding scenes, it's the 'just right' gift for those who assume such important duties on a very memorable day. ""It is unnerving to be told you're bad for children," Andy confessed. 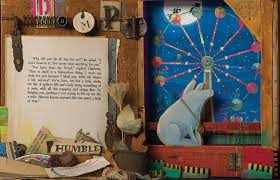 But he learned two things from writing Stuart Little: a writer's instinct is his best guide, and "children can sail easily over the fence that separates reality from make-believe. A fence that can throw a librarian is nothing to a child." Later in the same year that book came out ... "
Continuing on a writer's theme today, I want to share another superb picture book biography. In this celebration of beloved author E. B. White, Melissa Sweet does double duty. She shares his life story with great success, while also creating remarkable artwork to accompany her luminous text. She is an admirer and does all she can to provide readers with an expert accounting for his life and work. 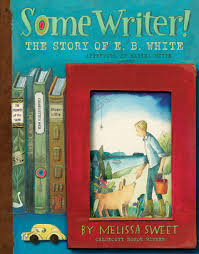 The three years she spent working on it were filled with many discoveries; first, through a relationship with Mr. White's granddaughter who provided access to primary sources that included photos, notes, drafts, letters, sketches; next, through keen attention to his many writings from childhood journals to his work at The New Yorker, to his much loved books for children; and finally, to his barn where she found inspiration for much of her artwork. This is a carefully and beautifully researched portrayal. E.B. White had a lifelong career as a writer. He wrote as a child with the encouragement of his parents and family. He wrote for The New Yorker throughout his lifetime, while also penning the three children's classics that have so endeared him to children, their parents and their teachers - Stuart Little (1945), Charlotte's Web (1952), and The Trumpet of the Swan (1970). He was co-editor of The Elements of Style, a book used by many writers, some of whose quotes concerning its impact on their own writing are included here and much appreciated. 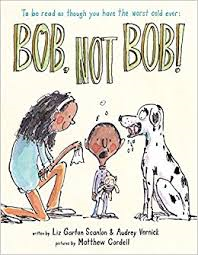 "The poet Joyce Sidman, a Newbery honoree, writes, "White's points in his "List of Reminders' are the fundamentals on which I have built my own writing style. 'Be clear' but 'Do not explain too much' and 'write with nouns and verbs' would be, indeed, the recipe for good poetry." Gorgeous collages feature watercolor illustrations, homemade paper, wood scraps, and maps merged with cartoons, family photographs, handwritten rough drafts, and other archival material. It is an artistic wonder. An author’s note, an afterword by White’s granddaughter, source notes, a selected bibliography, and a chronological list of his books bring the book to its conclusion. There is so much to see and savor in this original, stunning and innovative labor of love! I could go on and on. I am sure you have had enough - so, I will simply suggest that you find a copy, fall in love with its story and art, and place it tenderly on your 'keepers' shelf, as I have done. 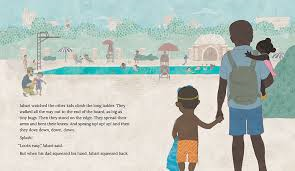 Yes, you, little boy ... "
As a long-time fan of Ezra Jack Keats and his work, I was delighted to learn that Andrea Davis Pinkney had written a picture book biography starring the man himself. I did not know Peter would play such a role in the telling. What a marvelous feat it is! 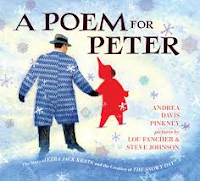 Using poetry to tell the story of a child of Polish immigrants seeking refuge from the oppression of Jews, Ms. Pinkney delves deeply into his life, his love of art, his motivation to share Peter with the world in The Snowy Day. Life in America was not easy for the Keats family. 'Jacob Ezra Katz' felt the sting of discrimination in his own life. Still, there was wonder in the world. painted the world's walls a brighter shade. Because, you see, Snow is nature's we-all blanket. When Snow paints the streets, we all see her beauty." After stops and starts along his artistic path, and harboring his childhood dream of making art his life's work, Jack returned to a world where jobs were scarce for Jews ("No Jews Need Apply"). He changed his name to make life somewhat easier, and it did. This also led to you, brown-sugar boy." The photos of a cherubic, confident child - ones Ezra had cut from a Life magazine years before - and a chance in 1954 to illustrate a picture book someone else had written was just the beginning for this amazing artist. to write and illustrate his own story. And then - oh, then - you! You had been waiting to be born. And yet, you were there all along." 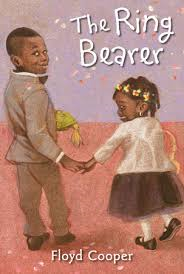 1962 - the first mainstream children's book to present a child of African-American heritage in a leading role. What a wonder! Peter was embraced by children and adults alike. He remains a favorite character for my grown kids. He will find his way into my granddaughters' hearts. 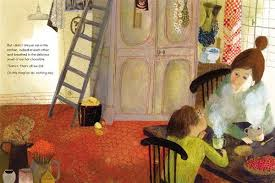 Today, we continue to share Mr. Keats wonderful books in families and classrooms. The writing is brilliant and memorable. I have returned to this book time and again to savor the telling. Lou Fancher and Steve Johnson bring their formidable talent to creating the collage images that pay respect to the man and the boy, their world and their stories. It is an impressive and unforgettable collaboration. Back matter includes Ezra's Legacy, Keats, The Collage Poet, a bibliography and a list of sources. "He dared to open a door. Warble offered her insects to eat. And there they stayed ... "
Warble is a small, and very observant, yellow warbler living on an icy island that affords him great joy in his life. He loves to watch the many different people who visit this special place. When a fog envelops it, he does his best to help it dissipate. When that doesn't work, he asks his avian neighbors what they think of it. They barely notice it, expressing little concern over the changes occurring. Warble is concerned. With no visitors to watch, and without much to see beyond the mistiness of this new grey world, Warble adopts a sense of ennui himself. Then, one morning, he sees ' a colorful speck' approaching. (#673 RED-HOODED SPECTACLED FEMALE (JUVENILE)). The two find each other. Warble can't believe his good luck! They enjoy many of the same things. After some time spent together, he mentions the fog. The human also sees it. were others who saw the fog too. She was unsure. How could they find out?" Two heads are better than one. They do their research, and make the discovery that others have also noticed the fog. Perhaps, with help, they can make a difference to its hold on the island. 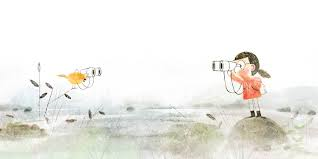 Kenard Pak 'used pencil, watercolor and digital work to make the illustrations for this book'. Brilliantly, I will add. 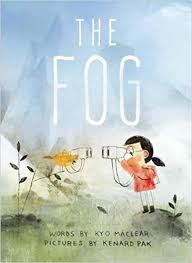 The threat of the fog and the joy found in human interaction add just the right touch to this lovely story. There is humor, and poignancy as well. Be sure to spend time pouring over the endpapers front and back to meet just some of the human characters Warble has observed as they spend time on his beautiful iceland. that some roads should ... "
School is back. Along with the buses' arrival this morning, I saw a bunch of kids riding their bikes, and a few teachers, too. It is that kind of day. That being said, I thought I would tell you about a book that I found very interesting. In the 1970s people were protesting a number of things. 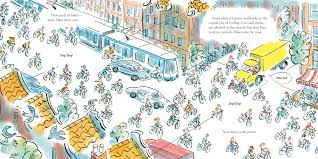 An activist mom in Amsterdam started a movement to make the streets safer for all who chose to ride bicycles. Today, if you were to visit Amsterdam, you would see people riding their bicycles everywhere in the city, and for many different reasons. There are more bikes than there are cars. to shop, to visit friends. This book is a testament to the persistence of people who believe in something, and will work hard to accomplish what they feel is important. The streets were so busy, that people felt they had no space for themselves on their roads. The route to finally have the laws change meant a lot of meetings, many demonstrations, publicity for the cause, and unfortunately the death of a child. Her father, a reporter, published a chilling statistic. our country. Many of them were riding bikes." It was the impetus needed to push for better conditions for all Dutch cyclists, and the beginning of a movement toward protecting the environment and encouraging people to be more active. And that is how Amsterdam became 'the capital city of cycling'. 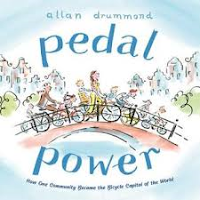 Readers will enjoy Allan Drummond's pen and ink and watercolor artwork. He fills the pages, including endpapers and front matter, with detailed images that accomplish his wish to have those who read his book see how much fun riding can be. Full of energy and movement, this is a book that will be fun to share when your school is hosting a bicycle rodeo. "Rain lashed Isabel as she shoveled water out of the boat. Scoop, pitch. Scoop, pitch. The bottom of the boat filled as fast as they could bail it out. Isabel, her mother, her father, her grandfather, Luis, Ivan, Senora Castillo, they all worked feverishly, none of them talking - not that they could hear each other over the storm. 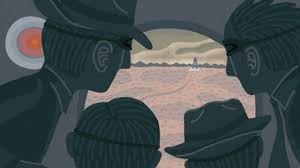 The only ones not bailing were Senor Castillo, who looked like a ghost ... "
Three families, three countries, three conflicts ... years apart, yet the effects for the families are equally devastating at any time. The three main characters, whose parallel stories are told in this heartbreaking book, have much in common despite their many differences. Josef is a Jewish boy living in Nazi Germany in 1939. His father has been in a concentration camp for a year before being released, with the instructions to leave Germany within hours. With his family at his side, they board the MS St. Louis bound for Cuba. When unrest breaks out in Cuba in 1944, Fidel Castro allows anyone who wants to leave the chance to flee. Isabel, her family and neighbors board a makeshift boat headed to Florida in hopes that they can land before being caught at sea, In such an event, they will be returned to Cuba. Mahmoud is a boy from 2015 Aleppo where his own government is bombing his city, leaving far too many without a place to live and with nothing to call their own. His family must use any means to make their way to Europe where they hope to find safety. They have much in common - a dictator, an escape by boat, a fervent desire to find peace and safety for each family. They endure terror, loss, hope, and are unbelievably brave in the face of tragedy. Nothing is easy here, and their stories offer a realistic look at families forced to leave the homes they love. Alan Gratz manages to share their stories through brilliant writing, all the while drawing parallels that end each of their chapters with heart-stopping action. The fact that he connects the three is quite a remarkable feat! Using historical fiction to bring these three remarkable characters to his readers, he is respectful of their circumstances, aware of the emotional toll, and fills his pages with the suspense that will not allow the reading to stop. 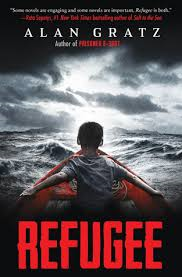 Urgent, dangerous action and full of empathy for the plight of migrants, this is a book that should be shared in middle and high school classrooms. Timely, and necessary - of that there is no doubt! "The older girl was quiet and proper. The younger was lively, with dark hair. When they visited the factory, she would play by the canal or write by the kitchen window. She wrote for hours. Even when her father called her, she wrote. The tree loved the sight of her." so moved and entranced that we couldn't speak." The tree, of course, does not understand why the family must be there for such a long time; nor, can it reason why they have to leave. In that way it echoes some of the feelings that many readers will have about the fate of so many, and the reason for such a war to have happened. Never dramatic, yet always touching, the author writes of those moments that are so defining in stories told about Anne, her diary, and her life in hiding. The father's return at the end of the war, his discovery of Anne's diary, and the tree that lived for so many years, keeping watch. Then, as life had come to an end for Anne, so does life for the 172 year old tree. a storm snapped the tree's trunk in two. Just like the girl, she passed into history. Just like the girl, she lives on." 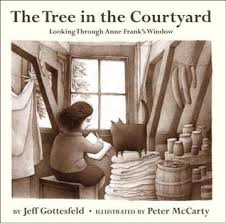 In an afterword, Jeff Gottesfeld adds information about Anne and the tree. While Anne lives on in the pages of her diary, the tree's saplings have been planted at a variety of American locations, all 'notable in the quest for freedom and tolerance'. Peter McCarty's wondrous sepia artwork reflects the sombre tone of the events, showing readers just how sad and serious the situation was for the people who found shelter near the tree's lofty branches. His shapes are softly rendered, the fine details add realism to the story told. The portrait of Anne in the final pages is quite lovely. "Raptors are known to fiercely protect their nest sites, and peregrine falcons are no exception. With their impressive flying abilities and sharp talons, peregrines can do serious damage to a potential predator, such as a raccoon or an arctic fox. 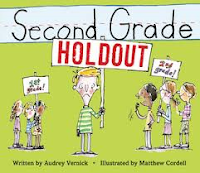 Peregrine parents have been known to drive away ... "
Somehow, this book got lost on the shelf that houses nonfiction books waiting to be posted. I'm sorry it has taken such a long time to review it here. 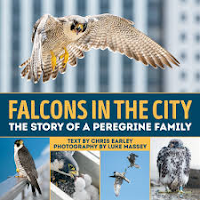 I was suitably intrigued by the subject because our city once boasted a long-time pair of peregrine falcons nesting on a downtown building. I am not sure that they are still there, but I found it fascinating to learn so much more about them when I first read this book. It is beautifully illustrated with clear, often breathtaking photographs of these masters of the sky. The story begins with Chicago resident Dacey Arashiba. He was surprised to find not one, but two, falcons sitting on the railing of his balcony, 28 floors above the ground. Chris Earley writes his story, and Luke Massey provides the incredible images that accompany it. Mr. Earley writes in chapters that move from discovery and identification, to every aspect of the learning done concerning these amazing predators. The information provided is detailed, and very clear. I love that it also tells the human story of particular peregrines and the journey made with them. It makes the learning for young readers more personal and attractive. I can't imagine there is much more to learn about these beautiful birds. prey is small enough, they often carry it to an elevated perch. Sometimes they eat small prey in the air as they are flying." said the bird with a song. "The moon belongs to me." said the bear in a burst. "And I don't like to share." The moon was definitely in the news last month. In the past few days, it deserves our attention once again. I love looking out and thinking that my family and friends are seeing the same harvest moon that I am seeing. It is quite beautiful. I had never considered that animals and the earth itself might be looking upon it with slight avarice. 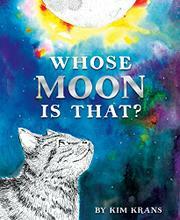 But, each mentioned in this lovely book from Kim Krans seems to think that the moon belongs only to them. The cat starts it, wondering just who might claim ownership of the sparkling orb so evident in the night sky. The tree is fast to respond, and the bird is quick to dismiss the claim, and make the same claim itself. And on it goes, until the many entranced by its wonder add a similar assertion. The moon has the final word. I'm a light for all. Yet no one owns my glow. Rhyming, gentle text makes this a perfect story to share at bedtime. As in previous books, Kim Krans uses bursts of color, and contrasting black and white to attract attention. 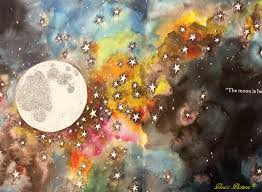 The moon shines out in bold white, touched with black dots and illuminating everything it touches. Gorgeous! Despite this new learning for the cat, there is another question at sunrise. same button over and over. I wished Dad were here. "What about a break from your game?" Mom growled. 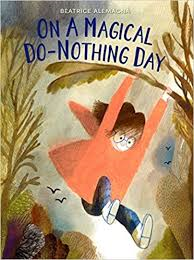 I have had a few magical do-nothing days lately. I can tell you that I enjoyed them immensely. We too often don't take time to care for ourselves. With school starting and all the fall activities revving up, many parents and kids will begin to feel the tension that comes with always being on the go. I hope that this book will remind them of the joy to be found in sitting back and taking note of the joys inherent in NOT always having a plan! It's the weekend. Time spent at the cabin should be fun; but, it's raining outside and there's nothing to do. Mom is busy at her desk, writing. Her daughter is languishing on the sofa, video game in hand. Tired of watching her daughter do 'nothing', the mom takes the game and puts it away. Before she heads for the outdoors, the girl finds the game and sets off. Trusting her game to keep her from boredom in the rainy environment, the girl makes her way downhill to the pond and some very enticing rocks, just meant for jumping. Alas, the game falls into the pond! "Without my game, I had nothing to do. The rain felt like rocks were hitting me. I was a small tree trapped outside in a hurricane." Now that sounds like a girl with gumption. As she slowly follows snails along a path, she is fascinated by the smells, sights and sounds of her surroundings. as far as my eyes could see. I noticed bugs I had never seen before." I absolutely love the colors, textures and shapes found in the artwork. Using gouache, oil, collage, and wax pencils, Beatrice Alemagna invites readers into a natural, rainy world. A neon orange raincoat keeps our attention on the small girl as she experiences the beauty of a world she rarely notices. It is quite the magical place. The story is so beautifully told. In the end, it leaves readers back in the cabin where mother and daughter savor cups of steaming hot chocolate while not saying a word. "Tyler's sisters say second grade is really hard. And Mr. Glazer's class is hardest of all. You have to learn the presidents by heart. Forward AND backward. Ready for the kind of spelling words he gives? Platypus. Rendezvous. Discombobulated!" Our poor narrator! Despite all the good things that happened in first grade, he is once again apprehensive about a brand new school year. All of his anxieties resurface, and he shares them with his parents. "We probably won't get fun jobs to do every day. "Your job is to be a good student," Dad says. That's just one example of why second grade is not for me. Also, Tyler's going to be in Mrs. Herman's class. And I'll be in Mr. Glazer's class." His parents are unwilling to consider any of his solutions to the problem. Going back to first grade would be so easy! No minds are changed. Tyler's sisters don't help in any way, gleefully filling his head with images of how tough Mr. Glazer is. Even the playground is different this year! When the girls admit they have been playing with his head, they turn to their own brother, regaling him with problems in Mrs. Herman's class. It takes no time for the boys to catch on to the tricks being played on them - after all, they are second graders! add warmth and humor. Every emotion is faced and shared. As I have said before, the anticipation is often worse than the reality. Tell that to the kids who are NOT so eagerly anticipating school starting today! Change can be sooo tough. 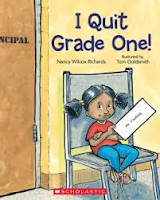 Hopefully, reading this book to your class (or your own kids) will help make the transition a bit easier. Cat is back! I am so happy to see this funny feline once again. The kittens' teacher, Ms. Melba, is off to an appointment with her doctor. 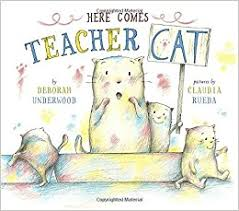 A substitute is needed, and Cat agrees to take charge of the class. Kitty School is not a familiar concept to this 'emergency' substitute and there is much to learn for all involved. Rudely awakened by the telephone, Cat has a plan for all-day napping. When that call comes in, plans change. It takes a bit of persuasion. 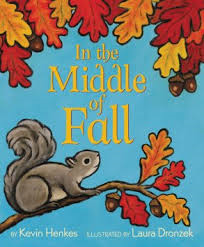 Keeping to the amusing bent of the other books, the narrator's voice and the subtle expressions displayed in soft images with ink and colored pencils are perfection. 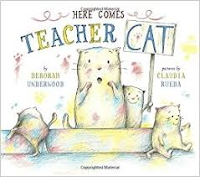 Cat works adeptly to determine the nature of the job and then the responsibilities associated with a day spent in a classroom filled with young charger. This familiar and loved character will make it a perennial request for reading aloud, and it is destined to be a great addition to the classroom baskets in the reading center: an author's work, or a favorite character series, or a funny stories basket. You choose where it best fits. Your students won't mind where they find it, as long as it there. "I said that we should do art three or four times a week. Ms. Carter only did art once a week, but I'm sure she would want us to have it more often. The new teacher should have boxes of glitter, different sizes of googly eyes and paint - not just boring colours either. We need colours like Ocean Blue, Raspberry Red and Jungle Green." Stella loves Ms. Carter, and she is not the only one. When she learns that Ms. Carter is going to finish the school year early to welcome a new baby, Stella's worrying begins. No substitute teacher can replace her. No substitute teacher will know the way Ms. Carter did things. What will happen to the first graders without her? Stella lets her parents know how she is feeling. They seem unconcerned, assuming Stella will like her new teacher as much as she likes Ms. Carter. when no one's looking, he tries to pinch me? blue bin because they have more pictures?" Totally familiar concerns for little ones, and legitimate in any brand new situation. I like that Stella decides to take her worries to the top, wanting to see the principal. He is not available. A letter might work! It takes effort and expresses her ideas for training the new teacher. She receives a reassuring reply from her principal, who issues an invitation. Often, the anticipation for change is much worse than the change itself! The art is traditional brush drawing with watercolor washes, and is a perfect complement to the tone and emotions felt by a young girl with legitimate worries. Keep it in mind when reassurances are needed. "When you sleep, your breathing and heart rate slow down. At first you go into a deep sleep, and it is difficult to wake up. Then you pass into dreaming sleep, when your brain is busier and you dream. These stages of sleep happen several times each night ... Your eyelids close, and your eyes do not move much, except during dreaming sleep." 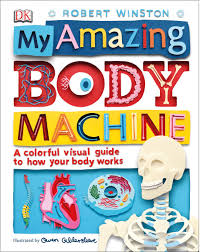 Nonfiction books from DK are always so wonderfully designed for the children meant to be their readers. The format is clear, and makes perfect sense even when the amount of information shared means there is a lot for young readers to grasp. In Robert Winston's clear description of each of our body parts, he provides a guide that shows how the body machine works. "It takes trillions and trillions of tiny living parts, called cells, to build just one amazing body machine. Guided by detailed instructions, these cells are organized into bigger parts that work together to make you, a unique human being." We are invited to visit every part of the body to see how it works on its own, and how one part connects to another part. 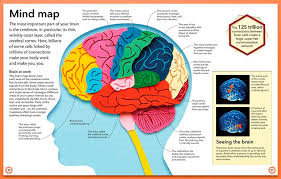 Included are text boxes filled with facts, captioned photos and illustrations to enhance understanding, thus making it easier for readers to take in all the information provided before turning to a new page. 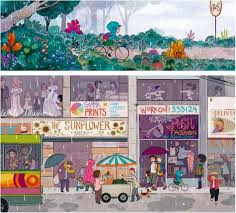 The illustrations are terrific, using cut paper images that give each a dimensional feel. It is a special journey and will be much appreciated by readers wanting to know more about their own bodies, and how they work. He misses nothing, and we are the lucky recipients of his research and skillful writing. This is just another perfect example of the commitment DK Publishers have to their audience and to learning. Be sure to check out their thoroughly entertaining and enlightening www..dkfindout.com where you will find more information than you ever thought you needed to know.